That's a decimal time watch made by Rainer Nienaber of Bünde, Germany, who produces unusual hand-made watches and clocks. 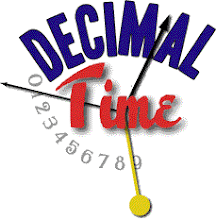 As with French decimal clocks, hours are marked 1 to 10 on the inner circle, minutes up to 100 on the outer circle. Nienaber's web page says "1 day = 10 hours" but this picture taken at a show earlier this year in Basel says "1 tag = 2 x 10 Stunden". If you're looking for a decimal watch that's not made by Swatch, this is it, although it will probably set you back a few thousand more! This blog is not just about iPhones! Jon tweeted about an app on Android, so I asked him for a review, which you can read below. Thanks for messaging me to ask for a review of the only Decimal Time app for Android. 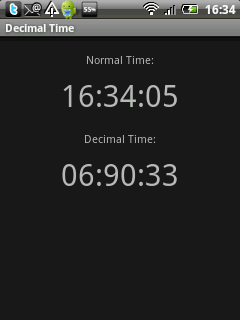 As you can see from the screenshot (from my HTC Tattoo running Android 1.6 - attached) it's a *very* simple app showing solely the 24h time and the decimal time equivalent. Like several of the apps you've mentioned for iOS it does suffer from the skipped dsecond issue every now and again. There are no settings, nada! The android market is improving and increasing rapidly and I hope there will be more Decimal Time apps in future. Also attached is a QR code link that will take an android device straight to the marketplace download link.